Even if you need lots of luggage you can still fly with FlyBe. You can do this by shipping all of your luggage to your destination with Send My Bag and thereby enjoying a pleasant onward journey without having to drag suitcases behind you. Simply have your luggage collected from your home and then delivered to your destination for a great low price. Find your free quote. On flights to/from the UK or Ireland, Flybe’s hand luggage allowance includes one larger item of luggage in the cabin, plus one smaller item. The larger item must measure no more than 55 x 35 x 20 cm, including the bag’s handles and wheels, and must not exceed 10 kg in weight. The smaller item must be able to fit under the seat in front. Compare Flybe's hand luggage allowance to that of other airlines. what if my Hand Luggage is overweight/ oversized? 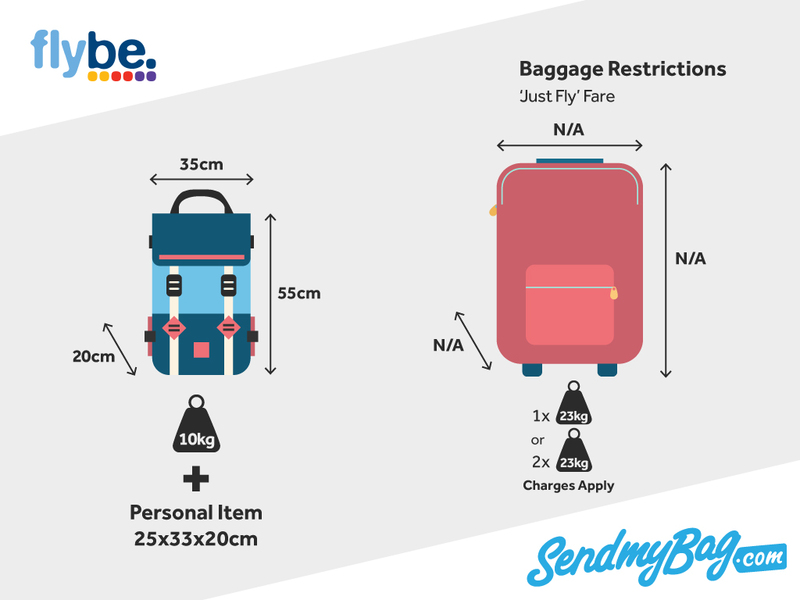 If a carry-on bag exceeds the dimensions or weight permitted by flybe’s hand luggage allowance, it will be placed in the hold, and the customer will have to pay standard airport charges for hold luggage. Standard ‘Just Fly’ customers must pay to check hold luggage, with the following options available if booking online: Small, 15 kg (one item): £19; Standard, 23 kg (one item): £24 (or £40 at the airport); 2 items of hold luggage up to combined weight of 46 kg: £48. ‘Get More’ customers can check in one item of hold luggage with a maximum weight of 23 kg, fACree of charge. ‘All In’ customers are allowed to check in two items of hold luggage free of charge, as long as these items have a combined weight of no more than 46 kg. Flybe’s hold baggage allowance does not extend to infants; however unaccompanied minors may carry one item of hold luggage free of charge. Excess baggage charges apply to all ticket types. These stand at £15 per kg. Exceptional baggage and sports equipment, such as bicycles, surf boards or musical instruments, must be booked on board via the Flybe contact centre, or at the airport. The fee is £30 per item and items can only be checked subject to space being available. Following the partnership of Eastern Airways and Flybe, passengers travelling on the Wales airlink after 29th October were forced to pay £20 to check their baggage, whereas hold luggage had previously been free of charge with Eastern Airways. Luckily this has been rectified, with the charge being lifted and passengers who had already paid the £20 receiving a refund. Looking for Flybe sized hand luggage?